Slightly later than planned... Here is the second example of a little maths helping to improve our analysis of a real economic problem. Seeing as I received some complaints about the calculus in my first example being too much for a blog post, I've tried to go for something much more basic this time. As such, the only maths that we'll only be using here is the arithmetic that everyone was taught in school. Again, however, those that are only interested in the final outcome can skip to the concluding "THOUGHT FOR THE DAY" and accompanying video at the bottom of the post! 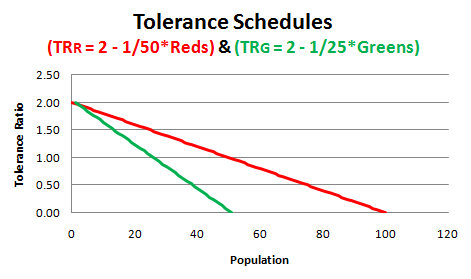 Finally, we assume that tolerance levels among greens and reds can be ordered sequentially from high to low. 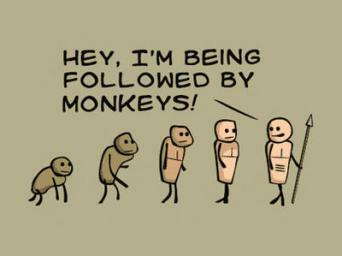 [**] For both groups, let’s say that the most tolerant individual will accept a ratio of 2:1... In other words, be willing live in a neighbourhood as a one-third minority. The median individual will tolerate a ratio of 1:1, while the least tolerant will accept no person of opposite colour in their neighbourhood. Note the placement of the green population on the vertical axis, and how this allows us to easily compare the interaction with the red population. There are three areas: 1) Any point within the overlap area (bottom left-hand corner) represents a combination of reds and greens that can coexist happily in the same neighbourhood. 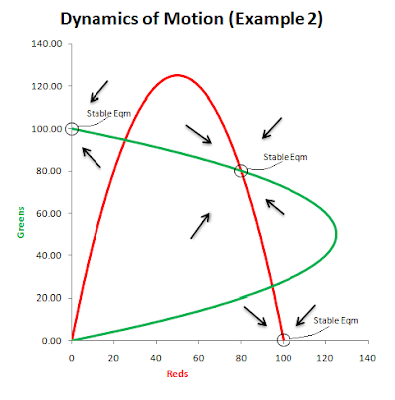 2) Points beneath the red curve, but to the right of the green curve, represent a mixture where all the reds will be satisfied, but not all the greens. 3) In contrast, any point within the green curve and above the red curve corresponds to a combination where all the greens in the neighbourhood are content, but not all the reds. 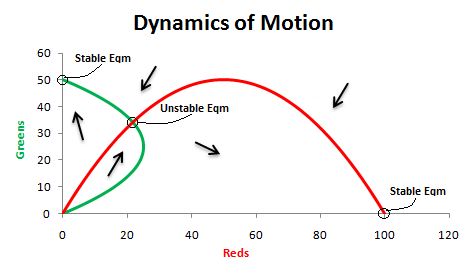 Importantly, the above figure also depicts the dynamics of motion of the system. This is what the arrows are showing us: We can see how the populations of the two groups will be changing at any particular point. [***] For example, the bottom-left arrow (pointing up and to the right) indicates that the numbers of reds and greens will be increasing together at low population levels. However, if reds begin to settle in the neighbourhood at a faster rate than greens, then some greens will be motivated to leave. This in turn exacerbates the problem, since the ratio of greens to reds now becomes even worse which prompts more greens to leave! And so... we inexorably move towards neighbourhood comprised entirely of reds. (This is depicted by the bottom-middle arrow that is pointing down to the right.) In this way, the dynamics of motion show us that we can approach three possible equilibria. However, only two of these -- the completely segregated outcomes -- are stable. The mixed equilibrium combination is unstable since any disturbance, i.e. the departure or arrival of a new neighbour, has the potential to set off a chain reaction that will ultimately lead to one colour completely dominating the neighbourhood! THOUGHT FOR THE DAY: It’s easy to assume that people living in segregated neighbourhoods are relatively racist. Similarly, we might also assume that people who express a desire to live in integrated neighbourhoods will automatically arrive at such an outcome through conventional market processes. However, the basic Schelling model shows that even small preferences for a degree of homogeneity – for just a few of our neighbours to be “like us” – is enough to cause segregated outcomes at the aggregate. (In other words, completely segregated neighbourhoods may be inevitable even when the majority of people are fine with being in a minority!) The model depicted here is very simplified and hardly perfect, but still provides extremely valuable insights into the emergent dynamics of segregation. It also illustrates how relatively simple maths can be used to deal with complex and counter-intuitive phenomena. PS - The above model is part of a broader literature called “agent-based modelling”, which is used for analysing anything from traffic flows to health epidemics. While maths was crucial to proving that his results held generally, Schelling initially used coins and a chessboard to illustrate his point. For a pretty cool illustration of agent-based modelling at work, try one of these two online versions of the segregation model. Or just watch the below video! [*] "Micromotives and Macrobehaviour" is the title of Schelling's brilliant book, which forms the basis for today's post. If the type of emergent economic outcomes that I discuss here is of interest to you, then M&M is a must-read. [**] In technical language: we assume that the cumulative frequency distribution of the “tolerances” of individuals is represented by a straight line. This is done for ease of illustration, although it is not overly problematic to experiment with different distributions (as Schelling does here). [***] What we have here is a simple phase diagram, which is very useful for analysing the stability of any dynamic system where you have to worry about things like multiple equlibria, tipping points, saddle paths, etc. You usually determine the direction of your arrows in a phase diagram by taking the first derivatives of your equations, but since I'm trying to keep things simple here I won’t bother with that now.